Located in Seoul, near Bukhansan Mountain, Hwa Hun is constructed using a special design so that it appears to unfold like a blossom amid the attractively constructed, but more ordinary, dwellings nearby. The bright exterior presents an irregular roof line that forms the outside “petals” of the house. Inside, level areas of garden are connected by stairs and walkways to flow from the forecourt garden, up the sides to a rooftop garden. 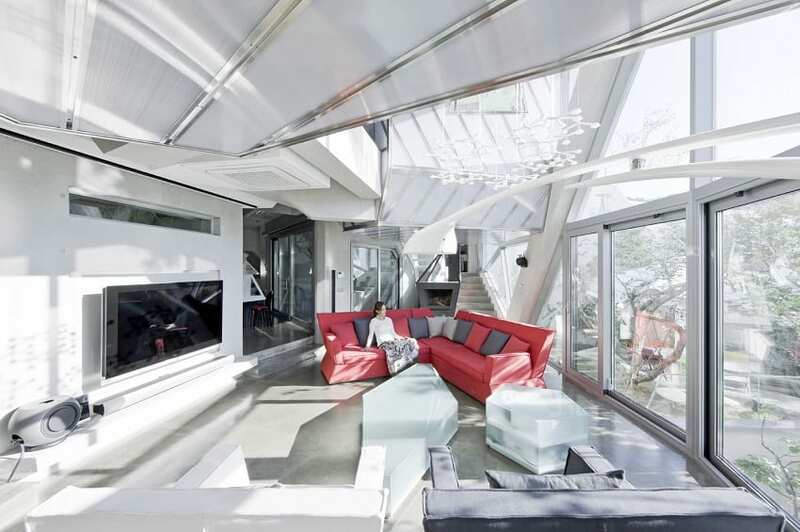 The whole assembly is an irregular polyhedron and was created in response to the owner’s request that the house be “living in nature.” The unusual design maximizes use of the steep, natural slope of the lot, and to maximize the use of daylight for home lighting. The living spaces of Hwa Hun flow naturally from the green garden spaces; in fact, in many instances, they are tucked under the various gardens: the forecourt garden, which welcomes entrance from the street, the inner court garden, the stair garden and the waterfall garden. All of the inwardly facing skins – those that do not front onto the street – are covered with greenery. This includes grass, fruit trees, and garden beds so that not only is the house shape itself a blossom, but the inner spaces of this dwelling will grow and bloom as the plants mature. The room designs are comfortable and practical; each is flooded with light – a design feature made possible, in part, by use of translucent and transparent panels, alternated with other materials. The translucent and transparent inner panels – essential for bringing light into the various rooms – makes extensive use of Danpalon. For example, the living room door and the door of the second floor room are both made of Danpalon set in wooden frames. The walls for the living room and the second floor room are double walled panels of Danpalon, and so is the hallway ceiling. The canopy is created using Danpalon over steel pipe. The opaque exterior makes use of exposed concrete and stainless steel roofing panels. Triangular recessed windows are finished with aluminum pairing and triple glass. A tempered glass handrail adds to the feeling of light. Connective seams are angled to add visual interest while managing the integrity of the roofing material. The end result is a living space that is visually interesting both outside and inside, and permits growing plants that range from grasses to the fruit trees previously mentioned. It even incorporates the waterfall garden, incorporating a peaceful and pleasing sound. Utilitarian areas, such as the parking garage with space for two cars and storage areas are tucked out of sight, yet are easy to access. The design includes a master bedroom and three smaller bedrooms, a master bath, living room, kitchen, dining room and utility room — there is even attic room at the top if a little more space is needed. The view from the roof top garden, where young fruit trees are carefully braced, reveals that Hwa Hun is nestled in a valley, surrounded by tall mountains. The design of the house resembles those mountains, rooted as it is through the basement garage, then opening onto the street level from the first garden, then sweeping up the two outer stairs to the roof top garden. It would be very interesting to view this house at a time ten years in the future, when the trees will be more fully grown and when it will have been home to a family. It has all the potential to become a Blooming House, indeed. 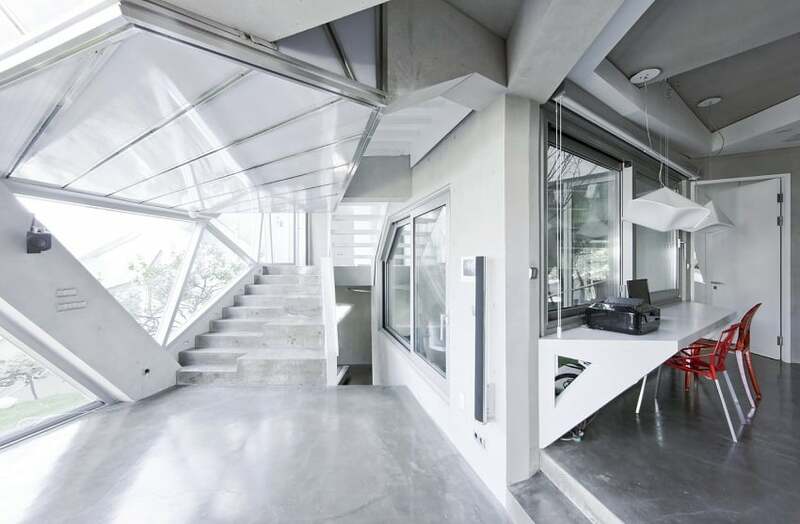 Home designs such as Hwa Hun are made possible by modern building materials that maximize use of daylight without forcing the occupants to endure excessive solar gain or blinding glare. Building materials, such as those from Danpal, help make these modern designs possible by making available transparent, translucent and even opaque materials that combine light and color to create designs that could only have been dreamed of by earlier generations of architects.